Talk about decadence! Hot beef bones straight from the oven. Digging in with a small spoon to extract the jiggly goodness inside. The marrow gets spread onto a toasted bread round, topped with some parsley salad, sprinkled with sea salt and down the hatch. As I watched the "bone juice" slowly solidify on my plate, I couldn't help thinking about my arteries doing the same. Not a dish to have regularly, but definitely a fun occasional extravagance. Is this the recipe from Fergus Henderson's first book? Looks great! Thanks, they were great - very rich. 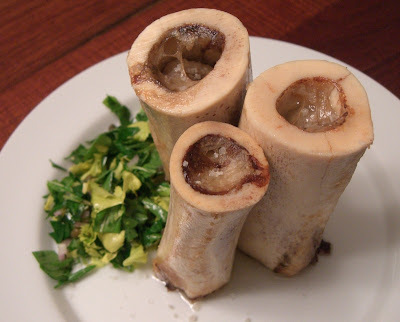 Actually, for this dish I followed the recipe from Bones, by Jennifer McLagan. It's very similar - she even mentions that she adapted it from Fergus's book, The Whole Beast. Primary differences: 1) she soaks the bones in ice water to remove the blood and 2) she adds celery leaves and arugula to the parsley salad.